Quality Test Method (QTM) tests are valid for a period of two years from the original test report date. To ensure continued support for another two-year period, these results must be renewed or updated, with the cost of testing borne by the manufacturer. To ensure continued support for another two-year period, these results must be renewed or updated, with the cost of testing borne by the manufacturer. 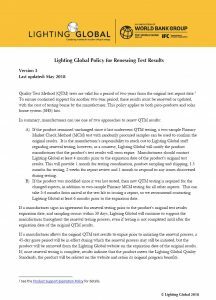 For renewal, if the product remained unchanged since it last underwent QTM testing, a two-sample Primary Market Check Method (MCM) test with randomly procured samples can be used to confirm the original results. If the product was modified since it was last tested, then new QTM testing is required for the changed aspects, in addition to two-sample Primary MCM testing for all other aspects. This policy provides further details on the renewal process.